Will Health Aid Take a Hit During a Recession? Overall flows of official development aid are positively correlated with the economic cycle in both donor and recipient countries.1 Aid for health is no exception. During global economic expansions, the revenue base of both donors and aid recipients expands leading to increased aid and public spending on health. During recession, the opposite occurs, at least historically. 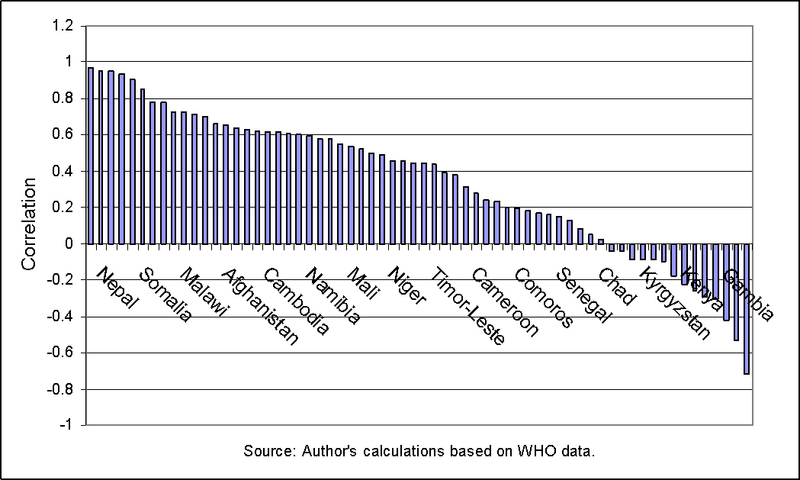 And because aid-dependent governments are liquidity-constrained and show little capacity for smoothing during periods of fiscal tightening2, aid for health does not act as a stabilizer, but instead reinforces the volatility of public spending on health in most countries. In 50 of 64 health aid dependent countries, deviations of aid from trend were positively correlated with deviations from trend of general government health spending over the past 10 years. (see graph below). Although most donor governments have the tools necessary to provide longer-term commitments5, long-term bilateral commitments and disbursements remain infrequent. A prominent example is the Global Fund – responsible for the finance of life-saving ARV treatment – which lived hand to mouth for four years before a three-year replenishment cycle was established in 2007. The reasons behind short-term commitments and resulting volatility are complex and may relate to a lack of political vision or priority given to the issue of duration, or to bilateral staff who find long-term programs unmanageable in weak governance settings. At Brookings Global, we are engaged in the search for innovative financing solutions to the problem of short-term, volatile health aid. A soon-to-be-released working paper reviews the potential of long-term financing instruments like the International Finance Facility or endowment funds, as well as mechanisms that can address disbursement volatility that occurs once commitments have been made such as swing facility to be administered by the World Bank’s IDA or drawing rights for governments with sound public expenditure management practices. 4World Bank. DRC Public Expenditure Review – Health Sector Discussion Draft, 2007. 5Lane 2008; In the US, for example, the Millennium Challenge Corporation has started a few 5-year health programs with no year funds committed upfront for a 5 year period. The UK’s Department for International Development (DfID) has 6 year support for the emergency health worker program in Malawi and 10 year partnership agreements with countries on education. The World Bank has Adjustable Program Loans that are conceived in a 10-year framework for institutional development (typically in 5 year tranches), including all the Multi-Country AIDS programs and others in health sector (Bolivia, Lesotho). The global health partnerships like GAVI and the Global Fund are also reliable sources of 5-year finance once committed.